REC(ession)IPES: (n.) Recipes that stretch a dollar in the kitchen without sacrificing taste or health. 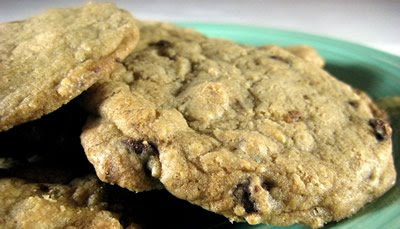 This recipe includes a neat trick that the LBUH picked up from a college roommate about how to keep your cookies chewy. Another great thing about this recipe is that it lets you satisfy your cravings for fresh chocolate cookies both now, and later. We always make a baking sheet (or two if we’re being honest . . . .) immediately, and store the rest of the batter in the freezer for later on in the week. ** Later, just put frozen chunks of cookie dough on a baking sheet, and increase the first cooking time slightly. In another bowl, combine the flour, baking soda, and salt. When thoroughly mixed, slowly stir the dry ingredients into the butter mixture. Once combined, stir in the chocolate chips. 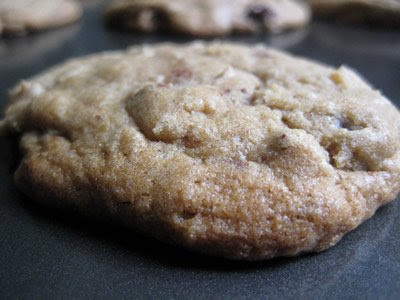 Place teaspoon-sized drops of cookie dough onto an ungreased baking sheet, and bake. After the cookies have been baking for about 5-7 minutes, remove the tray, and quickly slap the tray down on your counter. This should cause the bubbly cookies to quickly deflate and flatten. This is a good thing! Deflating the cookies helps them stay chewy after they have cooled. Place the tray back in the oven and bake until the cookies are beginning to brown, approx. another 5 minutes. Remove from oven and let the cookies cool on the baking sheets until they start to harden slightly (approx. 2-5 minutes), and then transfer cookies to a baking rack to finish cooling. * So, you may be wondering, what’s the “healthy” angle on this recipe? Ummm, not loaded down with E. Coli? That’s sounds healthy to us! Not good enough? Then we’re going to have to go with “all things in moderation”. **Or later in the month or season if you, unlike us, possess some of that “willpower” stuff they’re always babbling about. *** Our oven unfortunately has a draft, alas, so it usually takes longer. Yum, makes my mouth water! 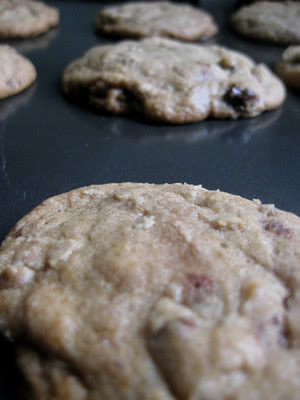 If only my LH liked chocolate chip cookies... Will just have to make some for block party and snitch some for myself! The other way to guarantee chewiness is to a) mix by hand (less air = more chewy) and b) substitute a few TB of corn syrup for same amount of the white sugar. ah...yes...the chewy cookie....comfort food at it's sweetest!! The cookies look so tasty! I love chewy cookies. I'm a big fan of all things in moderation... except that I have a problem with having only a few cookies. I like the idea to freeze the dough and save some for later. Great tip! I prefer crunchy chocolate chip/ oatmeal/ etc. cookies - probably explained by the fact that I have never been able to bake up a chewy batch - but my wife is always asking me to make my batches chewier. I told her the only way to do that would be to use Crisco instead of butter and that I was going to do no such thing. I am going to surprise her by using this recipe later on this week. If the counter-slapping technique works, she'll be eternally grateful. P.S. Marina is right. With cookies I usually mix by hand, and when I do they come out chewier - but I wouldn't necessarily say chewy. Great tip about keeping the cookies chewy! I actually have not heard about the recall. What was the reason?? I LOVE chewy chocoalte chip cookies. I wish I could have some of those!! always looking for that elusive perfect cookie recipe - thanks for the tip, I will try that. I have tried using an egg substitute for my PITA allergic son (the allergy, not the child, although their are moments...) but the cookies just are not as good. I now just give him a handful of chocolate chips while the rest of us eat the cookies and he is just as happy. Eek, I wrote a comment and it flew into cyberspace. Just want you to know, I love chewy cookies and plan to try your "trick" to make them chewy. Thanks. Mmmm . . . add some macadamia nuts and I'm in thigh-expanding heaven! 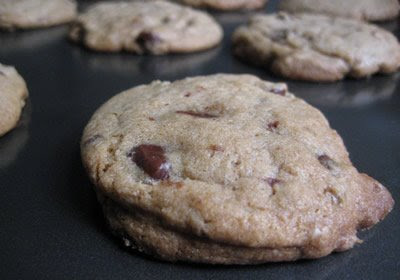 homemade cookies are better than store bought cookie dough! I'll take your cookies any day! Thank you for sharing. Yummy ! My cousin taught me to store cookies in a airtight container with a piece of bread in it, bread gets hard, cookies don't..great blog! For those who can resist having a big thing of cookies on hand at once, your cousin's trick definitely works and is a great tip! P.S. Thanks for the compliment! I'm always looking for new baking ideas and your chewy chocolate cookies look great! I love that they look soft and moist - that's how i like my cookies! I've been looking for the perfect chocolate chip cookie recipe. I'll give this one a try. Thanks! You need some milk with those cookies! I have experimented with egg substitutes (like ground flax) and they work great! Great recipe! sooo gooey!!! i just made them tonight! Just made them today - taste great! Exactly what I was looking for! Thanks! I would argue that baking homemade chocolate chip cookies and treating yourself to one (or two) is actually VERY healthy! When I deny myself stuff like this - under the guise of "being healthy" and "not eating bad food", it just makes me want it more! And yeah, those logs of processed cookie dough are probably action-packed with all KINDS of freaky stuff - e.Coli or not. Better to make it yourself and then share them with friends and coworkers. Makes me crave a glass of milk just thinking about them! What is a “NY $”? Poll: Animal, Vegetable, or . . . ?